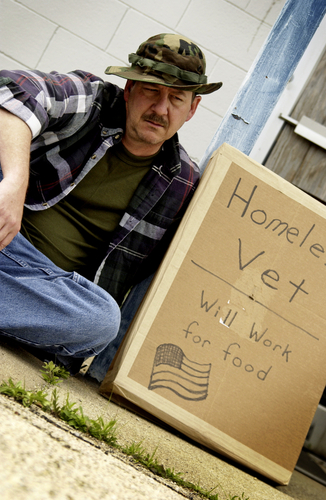 Homelessness in conjunction with severe mental illness increases early mortality risk in veterans, according to a new study published in the July Psychiatric Services. The Department of Veterans Affairs conducted a study to assess the impact of both homelessness and psychiatric disorders on premature death in veterans. Using the VA National Patient Care Database, researchers at the VA Center for Clinical Management Research in Ann Arbor, Mich., evaluated mental health status of 575,194 homeless and nonhomeless patients who died from 2000 to 2009. The deceased veterans were divided into four groups: homeless with severe mental illness (SMI), homeless without SMI, nonhomeless with SMI, and nonhomeless without SMI. The study showed that psychiatric disorders increased early mortality likelihood among veterans by 2.4 years regardless of homelessness status when compared with those without disorders—however, these numbers were amplified by homelessness. Homeless veterans diagnosed with mental illness had the highest risk for premature death among all groups studied and were more likely to die 10.3 years earlier than their nonhomeless mentally ill counterparts. Ending homelessness among veterans is a top priority for the VA, which recently implemented a broad array of programs addressing mental health and homelessness. The programs may prove helpful with these issues among the civilian population, according to VA senior consultant and psychiatrist, Ira Katz, M.D., Ph.D. “World War II led to the development of antibiotics as treatments…we hope that we will be able to tell a similar story about improvements in mental health care coming out of the wars in Afghanistan and Iraq,” Katz told Psychiatric News. For information about mental health issues of returning veterans, see Psychiatric News here and here.